In compliance with your request, I will now give you a history, as full in detail as the limits of the letter will permit, of the late awful visitation of Providence in this place and vicinity. On the 16th of December, 1811, about two o'clock, A.M., we were visited by a violent shock of an earthquake, accompanied by a very awful noise resembling loud but distant thunder, but more hoarse and vibrating, which was followed in a few minutes by the complete saturation of the atmosphere, with sulphurious vapor, causing total darkness. The screams of the affrighted inhabitants running to and fro, not knowing where to go, or what to do - the cries of the fowls and beasts of every species - the cracking of trees falling, and the roaring of the Mississippi - the current of which was retrograde for a few minutes, owing as is supposed, to an irruption in its bed -- formed a scene truly horrible. It is hard to truly imagine the disaster described by Miss Bryan*. Sadly, there were no camcorders at the time so there isn't any first-hand video revealing the pandemonium. However, the depiction above shows us something of the experience. 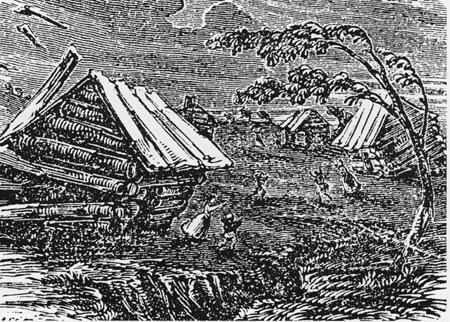 *Fantastic reading about Bryan's and other first-hand accounts can be found in Norma Bagnall's On Shaky Ground: The New Madrid Earthquakes of 1811-1812. 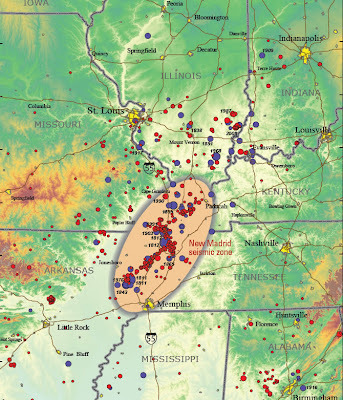 Liquefaction data indicate that New Madrid events occurred every 500 ( +/- 300) years during the past 1200 years. Ever been to Reelfoot Lake? For two hundred years, this area hasn't felt any quakes that compare to the whoppers mentioned above. Only two have registered higher than 5.0: a 6.6 quake in 1895, and a 5.4 temblor in 1968. Breaking News: Memphis felt an earthquake on Monday, October 29, 2012 at 7:39 a.m. Being magnitude 3.9, it went almost entirely unnoticed. The epicenter was located in Parkin, AR (about an hour's drive west from Memphis). The 1811-12 earthquakes were big. A sparsely-populated region prevented this quake from having more notoriety, otherwise it would rank up there with the San Francisco quake of 1906. 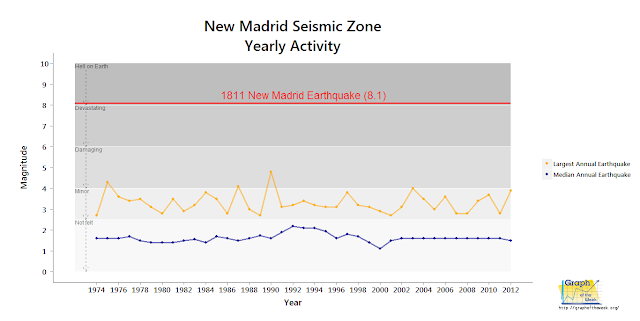 The yearly median quake size in the New Madrid region is extremely low, hovering around magnitude 1.6. Even though there have been over 4000 quakes since 1974, only 2 have been large enough to be felt - the rest are tiny. The largest measured annual earthquake in the New Madrid region has never risen past magnitude 5.0 since 1974. There is a trend since 2001 indicating that the system is in equilibrium. So what does all of that mean? Will there be another huge earthquake or not? Fact: the author of this article lived in Memphis at the time of Browning's prediction and insisted that his landlord include insurance protection against earthquakes in the rental agreement. Who's to say I can't get worked up with the best of 'em? "Our GPS data for New Madrid didn't show any motion. Specifically, they showed that the ground was moving less than 2 millimeters per year. That's at least 18 times more slowly than the San Andreas. We were also pretty sure that the number would get much smaller if we kept measuring for a longer time. Already it was a lot slower than we'd expect if a big earthquake were coming any time soon." "Geologists know surprisingly little about what's going on here. We don't know why earthquakes occur; when they started; if, when, and where future large earthquakes will occur; how serious a danger they pose; or how society should confront them." Looking back at the first graph once again (Figure 1), the last thirty-eight years show the New Madrid fault displaying remarkable stability. However, that's a mere sliver of time in the grand history of this area, so cannot be relied upon as a predictor of future events. 176 tremors per year (median) means that some sort of shock hits this region every two days or so. That seems like a lot until compared with the San Andreas fault, which checks in at seventy tremors per day! 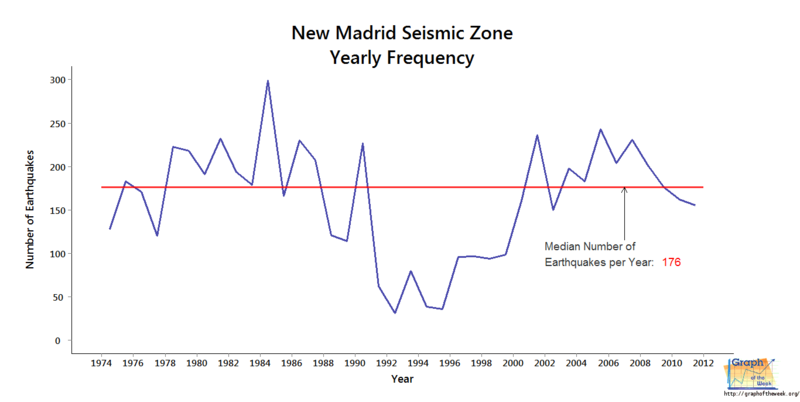 If anything, however, this would support the argument that the New Madrid fault is shutting down (if only we had these measurements dating back a thousand years...). It is rather interesting to note that for a few years in the 1990s the level of activity was extraordinarily low - even for this area. Ironically, this is the period during which Browning predicted a big quake would occur! Or Is It Cranking Up? 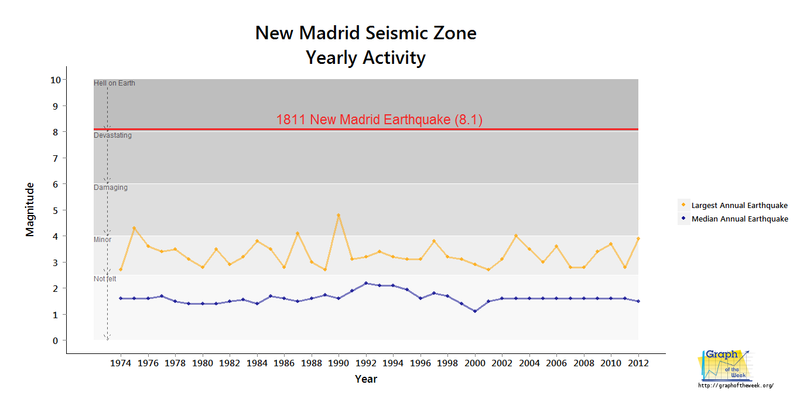 The panel concludes that the New Madrid Seismic zone is at significant risk for damaging earthquakes that must be accounted for in urban planning and development. That's not much of a prediction and in fact supports Stein's statement that geologists know 'surprisingly little' about what might occur. In fact, if you asked just about anybody around these parts, they would say the same thing (albeit in more plain language!). On the basis of a minimum recurrence rate of 200 years, we are now entering the period during which the next 1811–1812-type event could occur. And how big is that next period where an '1811-1812-type' event could occur? 800 - that's eight hundred - years. To be fair, time frames associated with faults span thousands of years (if not more), so it's difficult to achieve better precision. So what's the verdict? Is it shutting down or cranking up? The author hoped to find strong evidence one way or the other, but alas, it just isn't to be found - yet. Given the amount of data out there on the topic, one would think we knew everything about these things. In other words, your guess is as good as mine. There is one circumstance which I think worthy of remark. This country was formerly subject to very hard thunder; but for more than twelve months before the commencement of the earthquake there was none at all, and but very little since, a great part of which resembles subterraneous thunder. The shocks still continue, but are growing more light, and less frequent. -E.B. P.S. 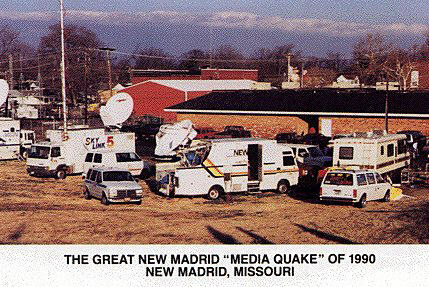 While the author does not believe any large earthquake is coming to the New Madrid area anytime soon (meaning within my lifetime), your opinion may differ. Feel free to purchase a survival kit in case of such an emergency. 1) Do other fault systems exhibit similar traits as the New Madrid system? 2) What is your prediction on whether or not another devastating earthquake will occur in this region? 3) What is the best way to predict earthquakes? Labels: Environment, History, R, SciTech, U.S. I'm using your blog to reinforce graph, chart, map, and critical reading skills in my middle school classes. I love your work. Keep it up! Thank you for your kind words. I'm thrilled to hear that you are using the content in an educational manner. If any of your students end up producing any sort of graphs or charts, let me know - perhaps we could create a section for students to show off their work.